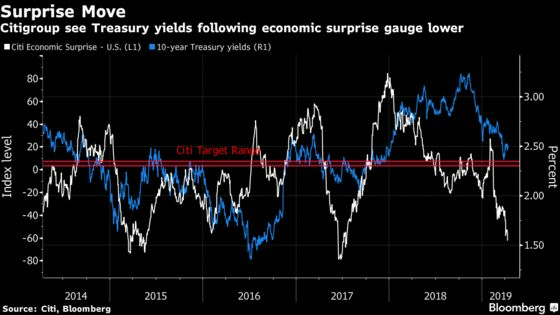 (Bloomberg) -- Ten-year Treasury yields should fall toward 2.30 percent as U.S. economic data continues to disappoint, according to Citigroup Inc.
With Federal Reserve rate hikes on hold, investors should buy bonds, though not necessarily sell stocks, strategists including Jeremy Hale wrote in a note to clients Thursday. The Fed could end up cutting rates more than the roughly two reductions expected by the market over just more than a year, according to the Citi team. The world’s biggest economy has lost momentum with only the labor market looking robust -- and even that is a lagging indicator that gave next-to-no leads on recessions in the 1970s and 2000s, they said. Further weighing on the growth outlook is a Fed that now seems to believe there is more slack in the U.S. jobs market to unwind before inflation starts to climb, they added.